Mr Bonang Mohale, CM (SA), Pr IMM, P Gr Dip Mkt (IMM) is the current Chairman of Shell South Africa Holdings (Pty) Limited, South African Petroleum Refinery (Sapref), Shell South Africa Marketing (Pty) Limited and Shell South Africa Refinery (Pty) Limited. He is also the Vice President of Sales and Operations at Shell South Africa (Pty) Limited. Mohale is a diminutive figure but he’s one man that has an energy and personality larger than life. Born on November 22, 1961, in Benoni, South Africa, Mohale grew up in Katlehong where he took up the roles of fatherhood, having lost his father in his late teens. As a photographer, he assisted in seeing his younger siblings through school. His family was poor but happy and the happiness kept them going. Bonang Mohale went straight to Wits Medical School after producing stellar matric results at Standard 10 (now called Grade 12). He spent four-and-a-half years at Wits, where he comfortably competed with ‘well-placed’ white kids and filthy rich foreigners. Mohale once said in an interview that he decided to go to Wits because he wanted to compete with absolutely the best in the world. At the time, he said most black doctors schooled at the University of Natal, black section, and Wentworth (Natal University’s medical school for Blacks). Immediately after he left Wits, he went straight to pharmaceuticals, where he spent 11 glorious years. It is known that he served through Product Management and New Business Development Management. He also served as an Export Manager at Logos Pharmaceuticals (MSD). In 1992, while at MSD, Mohale was the only delegate from Africa at the “Cholesterol Reducers International Conference” in Barcelona, Spain. Director at Hollard Insurance Company Limited, 2006 – present. 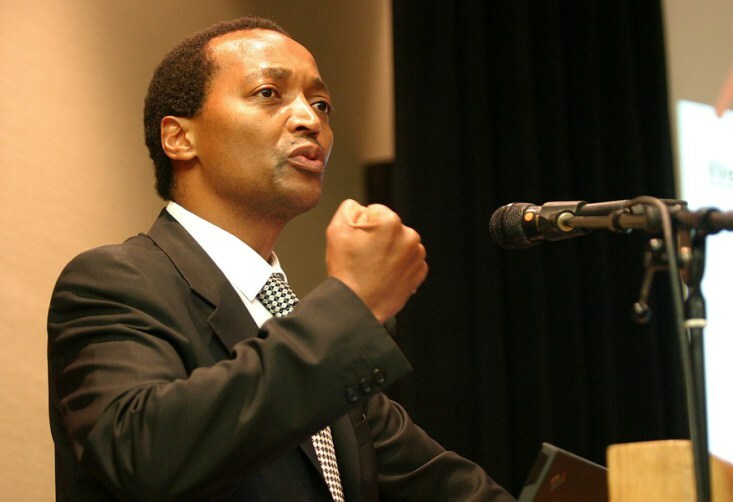 Chairman of Marketing Association of South Africa, 2007 – present. Director at Swiis RE Africa Limited, 2005 – present. Chief Executive at Shared Services and Associated Business SANLAM LTD, 2002 – present. Mr Bonang Mohale is the Chairman of SA Travel Centre (Pty) Limited and a Non-Executive Director of Black Management Forum Investment Company Limited since February 22, 2013. On June 14, 2017, he was appointed the new CEO of the Business Leadership SA (BLSA). Prior to the appointment, he was the deputy chairman of BLSA. Bonang Mohale has progressed through various positions. He joined Sandoz Products in 1994 as Head of Public Affairs and Communications Department. In 1996, he secured a spot at OTIS – the world’s biggest and oldest elevator company. Mohale led the OTIS Inland Region to improved business performance in General Management as Regional Manager and a Member of the Executive team. After some years of excellent service at OTIS, he was appointed to the position of the Managing Director of OTIS (Pty) Ltd. with responsibilities for South Africa, Zimbabwe, Malawi, Botswana, Zambia, and Namibia. He spent five years at OTIS. His areas of expertise lie in the field of Marketing Management and Business Administration and he previously served in these positions too. Non-Executive Director of South African Airways SOC Limited (alternate name South African Airways (Proprietary) Limited). September 2009 – September 28, 2012. The South African Express Airways SOC Limited. He stepped down from the position on July 21, 2012. Director of Innofin, Gensec Property Services and Fundamo. Chief Executive Officer at Drake & Scull Fm Sa (Pty) Limited. He served until December 31, 2008. SAA’s Executive Vice President for Alliances, Network Management and Global Sales. He stepped down in August 2001. Chief Executive Office of Shared Services and Associated Businesses at Sanlam Limited. He served as its Member of Executive Board until September 2002. He still serves as a member of Institute of Directors (IOD), Young Presidents’ Organization (YPO) and South Africa Israel Chamber of Commerce (SAICC). Presidential award for ‘Servanthood in South African Industry and the Economic Empowerment of Previously Disadvantaged Individuals’ – November 2001. The BMF Manager of The Year – 1997. Bonang Mohale comes from a family of seven. He is the fourth child but the first son of his family. He got married to his darling wife, Susan at a very early age of 17. His skills in photography helped him to put himself through and to pay lobola. Despite losing his father at 17 – precisely in 1979 – Mohale took up the responsibility of taking care of his mother and siblings. His success also is linked to gurus like Wiseman Nkuhlu, Wendy Luhabe, Lot Ndlovu, and others who imbued in him a will and dedication to succeed. Bonang has country responsibilities for the oil, chemical, aviation, marine, and lubricants global businesses. He is also operationally accountable for the retail, fuels, and bitumen.